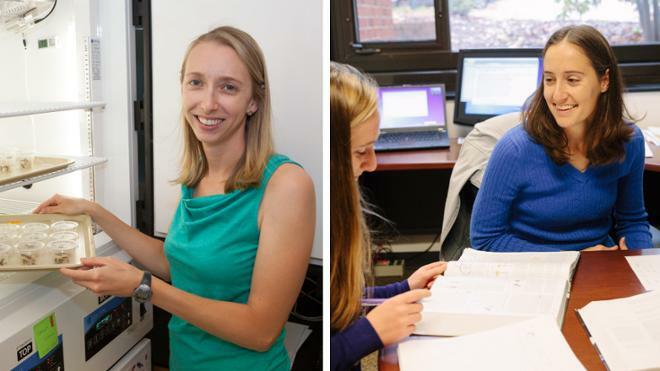 Biology professor Kristine Grayson and physics professor Christine Helms have each received a $100,000 award from The Thomas F. and Kate Miller Jeffress Memorial Trust to support their research. Grayson’s project will focus on the ecological impacts of the invasive European gypsy moth. This insect is a highly destructive forest pest, which has invaded Virginia and spread through the Appalachian Mountains and beyond. Grayson and her team, which will include two undergraduate students, will test for local adaptation, persistence and the spread of this invasive species under changing climates. They will collaborate with a team at Virginia Commonwealth University lead by Andrew Eckert. Grayson has taught at UR since 2015. She completed her bachelor’s degree at Davidson College and received her Ph.D. at the University of Virginia. She was a postdoctoral fellow at Victoria University in Wellington, New Zealand and VCU. Helms’ project will broaden understanding of electrospun nanofibers, which have potential importance in a vast array of fields including filtration, medicine and energy. Using computation and atomic force, scanning electron and transmission electron microscopes, Helms’ team will determine properties of the fibers under various alignment fields. Currently, little is known about the effect of alignment on individual electrospun fiber mechanical properties. The grant will support Helms’ team, including three undergraduate summer researchers. Helms has taught at UR since 2013. She completed her bachelor’s degree at the University of Mary Washington and received her Ph.D. and post-doctoral position at Wake Forest University.